We’ve always used wire crates for our FurKids. We like the fact the dogs can see out of the crates much better than a plastic crate but more importantly, we like the fact that wire crates offer much more ventilation. We’re always careful to never put them in their crates with their collars on because that’s a huge tragedy just waiting to happen. Collars can get caught in the wires and seriously injure or worse — strangle your dog. When a dog is caught in something, they don’t just sit there and wait for their owner to come to the rescue, they panic and fight to free themselves. They don’t understand that they can hurt or even kill themselves doing so, they just want free themselves. We’re always careful and try to think ahead about things that might potentially put our dogs in any kind of danger and after my scare with almost losing Nissa a few years ago we’re extra careful when it comes to watching for collar related dangers to them. After that near tragedy, our dogs don’t even wear collars at home. The only time they wear their collars is when they are leashed and one of us is with them. About a month ago I came home from work one morning, opened the door and found my entire 18×24 foot kitchen literally soaked in blood. There were puddles of blood, doggie footprints in blood and spots of blood from one end of the room to the other. I had no idea breaking a toenail could bleed so much. The first time he broke a nail we’d been to a friend’s country home where there was that tall brittle hay-like grass in hard patches that I knew Riley had been in. When he hopped into my SUV, I saw his foot was bleeding and found the broken nail. I called the vet, she told me what to do and a few weeks later he was fine. When I came home to the sea of blood and I didn’t find either dog bleeding from their heads or upper body I immediately checked for toenail injuries and found Riley’s left rear inside nail was broken and poking out sideways. OUCH! That had to hurt a LOT! It was early on a Saturday morning so I couldn’t reach my regular vet, got their recording to call the eVet in Madison which is about 45 miles away. I didn’t feel this required life or death (very expensive!) emergency treatment but knew he needed a vet so I called around town and found another vet who agreed to see us 45 minutes later. The bleeding was so bad that they had to cauterize the nail (horrible experience!) and even that didn’t stop the bleeding so they finished treating it and then wrapped it and sent us on our way with instructions for how to care for it. Since there is nothing else in our house for him to have hurt himself this way, we figured what had happened was that someone probably walked by the house while I was at work and in his hurry to fulfill his self-appointed duty as our Official Head of Security, he’d charged our of the crate, mis-stepped and caught his nail on the top wire along the bottom of the crate. It’s the absolute only thing that makes any sense whatsoever as to how this happened. See the arrow in the photo on the right. Just so there is no confusion, their crate doors are left open so they can go in and out as they wish during the night while I’m at work but are gated off from the rest of the house so they have the kitchen and the dog room when no one is at home. We had to find a way to prevent this from ever happening again. When we went shopping a day or two later we made a stop at one of our local Dollar stores looking for those colorful tube things that kids use for swimming to use to cover the wire on the bottom of their crates so neither dog can hurt themselves in this way again. We found a nifty product made of the same material as those tubes but more flat in a shape which reminds me of a miniature surfboard about an inch and a half thick. I think kids lay on them and paddle around in the water. Slit the styrofoam so it slides over the wire. Push the slit styrofoam down over the wire. Four days later I found more blood and that his outside nail was broken in the same way the inside nail had a few days before. To shorten this story, he’s now lost every nail on that foot, we’ve been to two different vets four times in the past month and even had three different kinds of x-rays done including a flouroscopy. Our vet bills for this total almost $750.00. Our theory that he mis-stepped when charging out of the crate has been re-evaluated and we feel that not only did he mis-step but he somehow managed to get his foot caught between the two bottom wires, panicked and fought to free himself which is what caused the rest of the nails to become injured and seriously bruise his foot. Although he had two vets and us both checking his foot, nobody saw the subsequent nail injuries because they appeared normal until one at a time they dried out from lack of blood supply to the nail and then they pop up leaving the quick exposed. 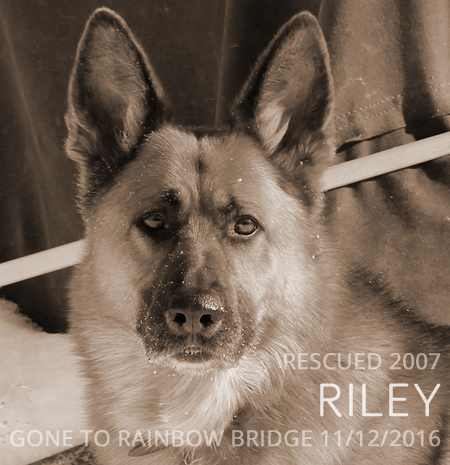 Riley’s been in a LOT of pain throughout all of this. The fourth nail popped up the other day and either fell off or he chewed it off the following day. It was very jagged at the end that had been attached to his body and this jagged nail poking into his skin had to really hurt every time he stepped. The x-rays and flouroscopy revealed no broken bones or disjointments so there should be no permanent damage when he’s finally healed up and all the nails grow back. He’s still walking with a very slight limp and his toes are “flipping up” when he walks which is scary (reminds me of opening a hinged box like a jewelry box) and I’m keeping an eye on it. Since there are no internal injuries nobody knows why his toes are doing this. My husband thinks perhaps he’s intentionally compensating for his foot pain and what probably feels quite weird to him without his nails, but we don’t know for sure. 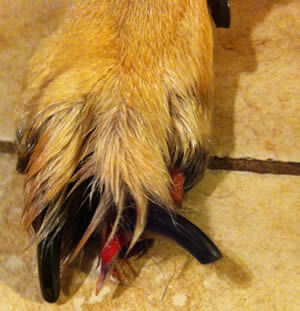 We’d like to urge you to take steps to protect your dogs from this same kind of injury. You can apply our fix or find one of your own, the point is to fix it before your dog is injured. 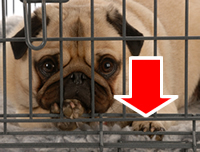 Our fix doesn’t allow the dog to even catch their nails on the wire when entering or exiting the crate which we feel is ideal. The entire wire area below the crate door is covered right down to the floor. 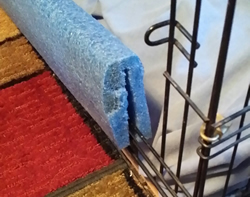 Our dogs would have to intentionally move the spongy-ish cover and stick their feet under it to hurt themselves. 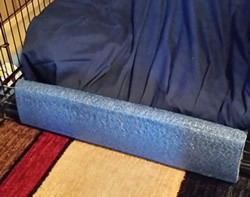 I do not recommend this fix for a crate that houses a puppy or a dog that chews on things because swallowing this material could cause some horrendous other medical issues. I don’t know if what’s used to color the material is toxic either. Our dogs aren’t chewers so it works for us. Use your heads and common sense and consider your dog’s age and habits when you research a solution for your own dog! 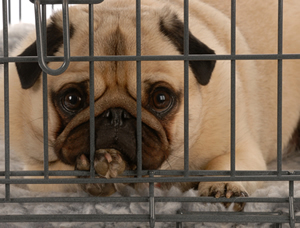 Do you have a story to share about how your dog injured themselves on a wire crate? I just had a completely different, but terrible problem with a wire crate. Colt is an 85lb Weimaraner. He and his sister Kimber have always shared a crate and it’s been fine for 5 years. The dogs are always very excited when their people come home, and are anxious to get out of their crate. On this day though, I opened the door and Colt kinda moved with the door meanwhile Kimber shot out of the crate like a rocketship. I noticed Colt’s paw was “attached” to the door. Upon inspection, what had happened was he had broken the weld that holds one of the vertical wires to the bottom horizontal wire. This allowed him to push his paw through (which bent the vertical wire outward), but when he tried to pull his paw back in, that vertical wire stabbed into his paw, trapping him. In fact, the end of the wire stabbed him through the webbing of his paw between his toes, and the paw was literally skewered on the wire. Luckily he didn’t tear his paw off the wire, and waited patiently (and still) for the human with opposable thumbs to extricate him. Also, it didn’t bleed too much, but left a rather nasty wound that was difficult to get clean. It’s healing now and not infected but we’re cleaning it each day and hopefully all is well. As an engineer, I’m surprised this potential failure-mode of this style crate never occurred to me. It’s extremely obvious now that i think about it. Wow! That had to be a really scary situation! I’m so happy to hear that the people finding this situation were smart enough to do things right and more importantly that Colt is ok. There are a lot of people that would have panicked and potentially made things worse no matter how good their intentions. Unfortunately, I don’t think there is a 100% safe crate made. Seems like for every crate model and type there’s a dog who finds a (usually unexpected) way to injure themselves. Kind of boils down to there being nothing perfect in the world. I think crate makers try, I really do, but nobody has come up with a truly safe crate. If your crate is very old it could also be that the welding has dried out or whatever that would be called. Everything man-made has limitations, perhaps it’s time to get a new crate? I dunno but I sure appreciate you sharing your story, thank you. We got ours at the Dollar Store in our city. Our 7 month old boxer/mix puppy just broke his toe on a wire crate the other day. Him and our other puppy were doing their usual playing/wrestling in the living room and when he went to retreat into his crate, he got his toe caught in the same part on the bottom of the crate where your dog was injured. After a vets visit, he’s now in a soft cast for a couple of weeks. I would like to try your idea of putting the paddle board material down, but since they are puppies, I’m not sure they could resist the urge to chew. I’m sorry to hear your pup got hurt :( I think you have a very valid concern. I do not think I’d trust a pup not to chew on this, it’s kind of like styrofoam but not quite so rigid. I can’t think of anything else you could use, either. Puppies might even chew on wood if that was a viable option. Hmmmm, maybe you could somehow stuff/wrap the area tightly in an old quilt, tying knots to keep it in place? Aw the poor thing! So glad you came up with such an innovative way to keep him safe.